PRODUCT DESCRIPTION: Fine mesh like screening which is made of strong plastic. It's very tough to chew through but is very easy to cut. It's also easy to fit over and around plants or other items you want to protect from nuisance birds or animals. TARGET ANIMALS: Birds, rabbits, deer & other chewing and eating animals. WHERE TO USE IT: Just about anywhere. 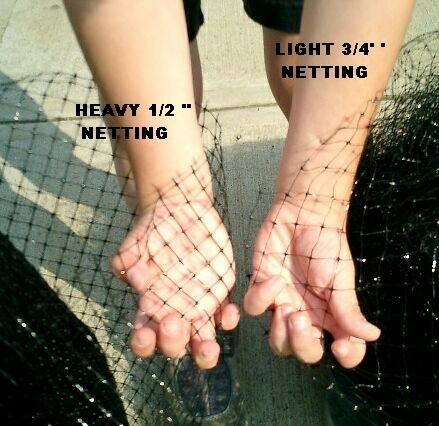 Netting can be placed over shrubs, trees,fruits, vegetables, plants, sensitive structures, artwork and just about anything found out in yard which needs protection from nuisance birds or other small animals. Of course it can be used inside as well like malls or homes which house small animals that are targeting something which needs protection. PACKAGING & COST: There are several sizes and grades(listed below) of netting available. We have the Heavy Duty (HD) 1/2 " and Light 3/4" (REG). The heavy duty is about twice as thick and is therefore both heavier to work with and stronger for when the target animal is persistent and big. For most bird situations, the light grade is adequate. It is easier to work with and because it weighs less it is better suited when you need to cover vast areas or expanses. Listed below are the sizes we sell.